How long does it take to hand-engrave the length and breadth of a 1992 Honda Civic? No less than 5,000 hours. Artist Shawn Lisjack thinks it's worth it, and he's not even finished. Lisjack made this car by carefully etching out layers of black paint over white primer on the car's metal and carbon fiber body panels. The hood alone took some 600 hours to complete with his Dremel and diamond-bit drill. Lisjack told Justin Hyde at Motoramic that he picked up engraving in 2007, and quickly realized he could apply the technique to the painted metal surfaces of cars. "I wanted to create something that was truly unique and 'one of a kind' that the world has never seen before." Lisjack hasn't just done the exterior, but also the valve covers, strut towers and a few other components as well. Amazingly, he told Motoramic that he still thinks he has 1,000 hours of work left to do. I will be adding color within the hand engravings to make the engravings pop. After that, the car will be clear coated to help preserve the engravings and finally a clear bra protection film will be added to protect the car from getting rock chips and other damage. 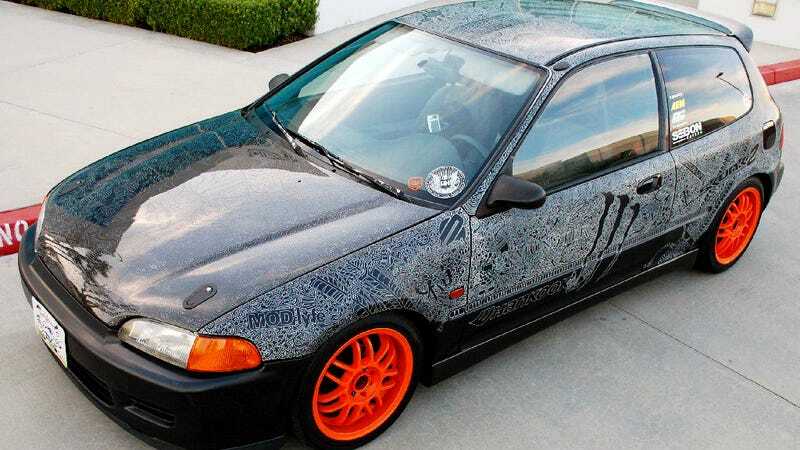 If anything, the 'Engraved EG' goes to show that you don't have to settle for making just another cookie-cutter custom car, and that a little creativity can elevate even a humble Civic into something extraordinary.